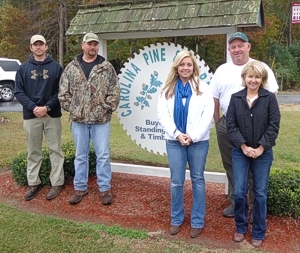 t Carolina Pine & Hardwood our goal is to provide forest landowners with top market prices. By the completion of every harvest, our customers can expect to be satisfied with the quality work we do. We take pride in the fact that so much of our timber cutting business comes from referrals and return business. Located in Windsor, NC Carolina Pine & Hardwood buys timber in a 100 mile radius, covering northeast NC and southeast VA. We buy all pine and hardwood timber products. Our professional contract loggers are capable of harvesting everything from first thinning and second thinning pine stands to clearcutting, low ground pressure logging, swamp logging and chip harvesting. We encourage landowners to maximize their assets by reforesting and we can assist in that process. Let us meet with you, inspect and appraise your timber. Appraisals are at no cost to the landowner. Again, our goal is to provide the landowner with top market prices, a quality harvest operation, and a relationship that will carry on to future business. Thank you for your interest in Carolina Pine & Hardwood.